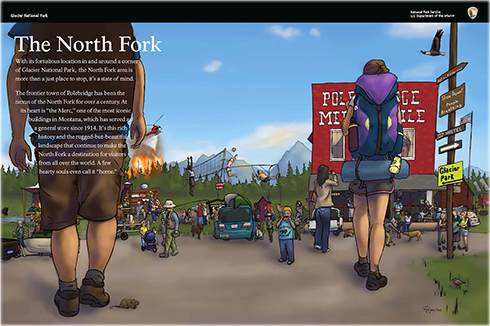 This wayside exhibit interprets the cultural nexus of the North Fork and the people who travel from around the world to experience this unique place. The wayside itself is located outside the Glacier boundary in the tiny town of Polebridge, MT. Can you find the black bear? The town's zip code (59928)? The guy spilling his coffee? That last one is based on a true story.